This is a terrible book to read if you have just moved and find yourself still surrounded by boxes. Those boxes will not get unpacked. It is also a horrible book to read if you’ve just moved into a new house and you are not yet acclimated to all of the creaks and groans that an old house makes at night. 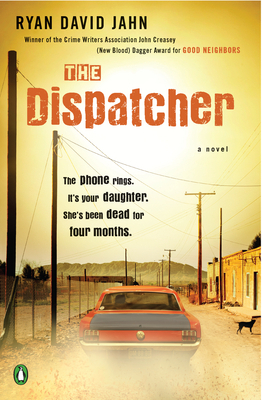 But the reason it is such a terrible read in those circumstances is because The Dispatcher is an incredibly gripping thriller. Ian Hunt is the police dispatcher in a small Texas town. He is just finishing up his shift when the phone rings. A young woman cries out for help. When he asks for her name, she replies that she is Maggie Hunt. Maggie is Ian’s daughter. She has been missing for seven years. The call is quickly cut off – her kidnapper has discovered her escape and caught up with her. Ian sets out to find his daughter and take revenge on the one who stole his daughter. Author Ryan David Jahn chooses to take us within the mind of each of the main characters. We switch between Ian’s grief and determination, Maggie’s fear and desperation, and the warped reasoning of the kidnapper. I found it fascinating that the reader knows from the beginning where Maggie is and the identity of the kidnapper. This doesn’t diminish the tension, though. Jahn makes it clear early on that no one is safe in his book. I enjoyed the realism of this novel. ‘Good guys’ can die, injured people get slowed down by pain, and someone who seems truly evil is often motivated by something other than cruelty. I’ve seen a few too many movies where heroes who should have died an hour ago keep moving and villains are seemingly evil for the pure pleasure of it. In The Dispatcher, we get to know a hero who is both fallible and mortal and a nemesis who has a twisted sense of morality but a true desire to make his wife happy. It was interesting to see how Jahn wrote Maggie. She is a fourteen year old girl who has been living in a basement for the past seven years of her life. His descriptions of her inner demons are really fascinating, but I had some pause with the way he described her. She was always described as being small in comparison to everyone else. Assuming that she hasn’t been malnourished (and we get no indication that she has), I think that most girls have had their major growth spurts by that age. From the descriptions, I sometimes thought for a moment that she was much younger than fourteen. This is a minor complaint, though. The Dispatcher is truly one of those edge of your seat, stay up until 2 a.m. to finish it sort of books. It is a rather graphic story, though. If you don’t do well with blood and violence, this is not a book I would recommend to you. Ryan David Jahn is an author who gives his readers both a compelling plot and realistic characters. I will definitely visit his writing again. Glad you got a respite from packing. You deserve it! I really felt the tension. It seemed as if the author could actually kill off the dad in this story. I really want to read the Game of Thrones books, but I feel like I have to make some time since they are so big! I heard about this while doing assignment on australianwritings.com and because of them i expected a lot from this site but honestly this site didnt live upto my expectations!! Why wont you change your posting pattern?